Life with Lynnie: Happy Birthday, Jesus! Merry Christmas! 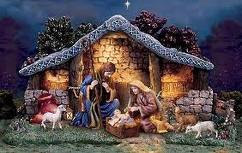 Today, is the day that we Christians celebrate the birth of our Saviour, Jesus Christ. Since we truly do not know what the actual date of Jesus' birth was, some people believe we should not celebrate His birth at this time, since this time of year was a pagan holiday, previously. However, in my opinion, it matters not which day we celebrate Jesus' birth, as long as we celebrate it. After all, if He had not come to earth as a babe in a manger, fulfilling Old Testament prophecy, He could not have grown into the man who allowed Himself to hang on a tree, a wooden cross, die for the sins of the whole world, of all who will believe. He wouldn't have been there, to fulfill God's prophecy and provide us with eternal life. Whether or not you agree with me is of no consequence, for I will celebrate my Lord's birth and be grateful He died for me. Know that I will pray for you, whether you are a believer, or not. She knows Jesus is the real gift and reason for the season! Merry Christmas to all those I know and love, here on earth and who are in heaven, including my love, Gordon...my brother, Glenn...and my friend Anne K. who went to be with her Lord, December 22nd, 2010.